Instead of the button-operated models that have dominated the market for years, many anglers want fish finders that have touchscreen interfaces like modern phones and tablets. It is difficult to find touchscreen interfaces at low price points, but there are a few models on the market that won’t completely break the bank, including the Humminbird SOLIX 10 – the most affordable model in Humminbird’s SOLIX series. Every model in the SOLIX series features a very high-quality touchscreen interface, which allows you to control the fish finder with taps, swipes and pinching motions. Additionally, unlike some other models that suffer from frequent “false touches,” caused by splashing water, the SOLIX series features CrossTouch technology, which all but eliminates these problems. There are two different models available based on the Humminbird SOLIX 10 platform: the SOLIX 10 CHIRP GPS (featured here) and the SOLIX 10 CHIRP MEGA SI GPS. The SOLIX 10 CHIRP GPS provides an affordable way to enjoy the SOLIX platform and earns a B+ rating from Fishing Tech. By contrast, the SOLIX 10 CHIRP MEGA SI GPS costs a few hundred dollars more, but it comes with down- and side-imaging capabilities. Accordingly, it earns it an A- grade from Fishing Tech. The Humminbird SOLIX 10 is packed with high-value features, designed to make it easier for anglers to find and catch fish. Most high-quality fish finders utilize CHIRP technology, which emits signals that sweep across a range of frequencies. This helps to provide greater detail and target separation than conventional sonar units do. However, the SOLIX series fish finders – including the SOLIX 10 – utilize broadband CHIRP sonar, which sweeps across even more frequencies, to provide previously unattainable target separation and detail. Additionally, the broadband CHIRP functions for the SOLIX 10 can be tweaked in a number of ways, which gives you even more control and flexibility. Screen size is a big emphasis for the SOLIX line, and even though the SOLIX 10 is the smallest model offered, it still provides you with a very nice and easy-to-see display. You can control the unit via the touch-screen interface, which not only allows you to select options by touching the screen, you can also swipe or pinch the screen to manipulate the device. Additionally, because the SOLIX 10 features Humminbird’s CrossTouch technology, it limits false touches from splashing water. It is one thing to know what is happening beneath the surface, but the SOLIX 10 CHIRP GPS also helps you to detect obstacles and features on the surface too, thanks to its included HD Radar module. This will help keep you safe and allow you to navigate with confidence, even in low-visibility conditions, such as fog or dim light. Like most other premium and professional-caliber fish finders, the SOLIX 10 CHIRP GPS comes equipped with a high-performance GPS module. This allows you to find your location, navigate with ease and even determine your boat’s speed at a glance. The GPS module also works in conjunction with several other functions provided by the SOLIX 10 CHIRP GPS. SwitchFire is Humminbird’s sensitivity-adjusting system, which allows you to quickly switch between CLEAR and MAX modes. The CLEAR mode helps reduce screen clutter in choppy waters, thereby giving you the best chance to spot fish amid the noise. By contrast, the MAX mode cranks up the sensitivity, so you won’t miss the tiniest details in calm, clear water. It doesn’t make sense to load up a fish finder with fantastic sonar technology if you don’t incorporate a high-quality display, but fortunately, Humminbird sidesteps this problem entirely. The SOLIX 10 CHIRP GPS comes with a 1280H x 800V pixel, 10.1-inch screen. Not only does this screen look great from all angles, it has enough resolution to display subtle details that other monitors may not display crisply. Anglers who fish uncharted or small waters are often at a disadvantage, given that they can’t consult a map to see the lake’s structure. However, AutoChart Live alleviates this problem entirely by giving anglers the chance to make their own maps on the fly. AutoChart Live also works with any existing charts you may have, so you can add more detail if you like. The SOLIX 10 CHIRP GPS allows you to control the unit and view the display via your smartphone, tablet or another Bluetooth-enabled device. This way you don’t have to run up to the display to tweak your sensitivity settings or see fish lurking under your vessel. Additionally, the ethernet connections included with the SOLIX 10 CHIRP GPS allow you to hook your fish finder up to several others, to create a multi-unit powerhouse. SmartStrike takes a lot of the guesswork out of fishing by providing anglers with location recommendations, based on historical fish patterns and weather data. This way, you won’t have to cruise around blindly, until you stumble upon a productive location. Instead, you can just activate SmartStrike, and head to the location indicated. Offshore anglers often have difficulty finding a sonar unit that can penetrate to the depths they require. That’s no longer a problem, thanks to Humminbird’s Xtreme Depth technology. Capable of imaging clearly down to 5,000 feet, you won’t have to worry about all the deep-water fish you are missing anymore (optional add-on transducer required for Xtreme Depth mode). The Humminbird SOLIX 10 CHIRP GPS is an impressive fish finder, but, like all fish finders, it does have a few drawbacks. And while most of these are offset by the unit’s impressive features and quality, it is important to consider the strengths and weaknesses of any fish finder before making your final decision. Very nice touchscreen interface provides precision control of the unit. CrossTouch technology allows you to navigate the various screens, tweak settings and zoom with ease. Requires an optional transducer to access Xtreme Depth mode. Screen is smaller than some comparable fish finders. Whenever you are trying to select a fish finder, it is important to compare your chosen model to other options available on the market. This is the only way to ensure you are getting the best value for your money. When doing so, it is important to compare the model with others made by the same manufacturer as well as a few made by other companies. 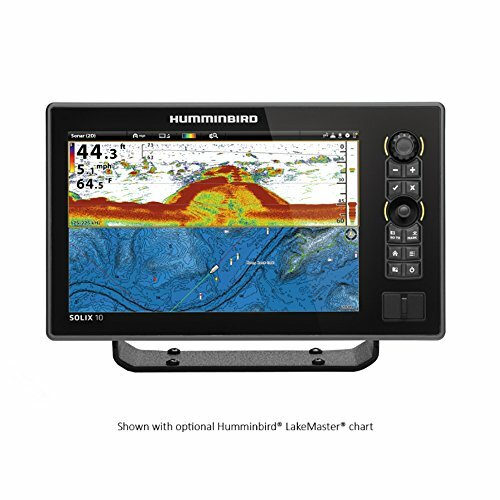 Humminbird produces a number of different fish finders at or around the $2,000 price point. And while they are all high-quality units that will elevate your fishing, they each offer a different set of features. The most similar SOLIX series product to the SOLIX 10 CHIRP GPS is the SOLIX 10 CHIRP MEGA SI GPS. While the former provides anglers with the most affordable way to obtain a SOLIX series fish finder, the latter is a better-equipped model, which costs about $300 more. The biggest difference between the two units is the inclusion of MEGA side- and down-imaging in the SOLIX 10 CHIRP MEGA SI GPS; the SOLIX 10 CHIRP GPS provides no such functionality. While it is a bit disappointing to see this technology missing from a $2,000 fish finder, some anglers may not miss it and will appreciate the savings provided. The HELIX 12 CHIRP MEGA DI GPS G2N is another Humminbird fish finder that is also priced similarly to the Humminbird SOLIX 10 CHIRP GPS. This Helix series fish finder is priced comparably to the SOLIX 10 CHIRP GPS, but it provides a few features that are not included in the SOLIX model. The most notable such feature is MEGA down-imaging, which provides extremely detailed scanning sonar images; however, the HELIX 12 also boasts a screen that is 2 inches larger than the SOLIX 10’s screen. The SOLIX does, however, utilize a touchscreen interface, while the HELIX 12 relies on traditional buttons. See our Humminbird HELIX 12 Review. There are a few other fish finders on the market produced by other manufacturers that are priced comparably to the SOLIX 10 CHIRP GPS, but once you reach this price point, you’ll need to start thinking about multi-component units, which feature separate displays, transducers and computers. This will increase the amount you’ll have to spend significantly, which means that anglers seeking a complete fish finder package will have to choose from only a handful of options. However, Lowrance makes a few products priced comparably to the SOLIX 10 CHIRP GPS, including the Elite-12 Ti with Total Scan Transducer. The Elite-12 Ti provides anglers with a touchscreen interface and a large, high-quality 12-inch screen. It also provides down- and side-imaging scanning sonar capabilities and is ready to connect wirelessly to your smartphone or tablet, via WIFI or Bluetooth technologies. It clearly provides more features than the SOLIX 10 CHIRP GPS, but some anglers may simply prefer the Humminbird interface and CrossTouch technology. See our Lowrance Elite 12 Review. The SIMRAD S2016 Fishfinder is about $1,000 more than the SOLIX 10 CHIRP GPS, but it comes with an incredible 16-inch screen and broadband CHIRP technology. However, it does not provide touchscreen functionality, and you’ll have to purchase a transducer separately. Touchscreen displays are becoming more common in fish finders, but they are still less common than traditional, push-button models. Accordingly, anglers who want a touchscreen interface will only have a few models from which they can choose. Fortunately, Humminbird’s SOLIX series not only provide touchscreen capabilities, they also offer most of the high-end features anglers would want. 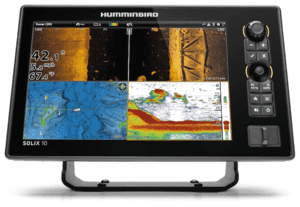 The Humminbird SOLIX 10 CHIRP GPS is one of the best models for those interested in obtaining touchscreen capabilities for the lowest possible price, but it is disappointing that this model doesn’t provide scanning sonar technologies. Accordingly, Fishing Tech rates it as a B+ product. By contrast, the SOLIX 10 MEGA SI CHIRP GPS is only a few hundred dollars more and provides both down- and side-imaging capabilities, which earn it an A- grade.